What better way to get inspiration for a wildlife pond at home, than to visit one in its Spring glory! 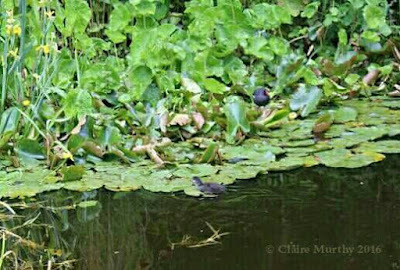 The photo shot of the pond is not a close view - but a young coot is on the lily at the front of the image; a pond doesn't only serve the mini-beasts of the water - it extends its value to birds and larger wildlife too, which can be a joy to observe! This coot is sitting on a lily pad for a reason...it was his lift; as he climbed onto a pad, his weight caused it to sink down - just enough to help him glide into the water.